Devolved control of health, and integration with social care, creates an opportunity to improve care outcomes, improve value for money and decide local priorities for Greater Manchester, argues Lord Peter Smith. We are on the brink of a new era in Greater Manchester when we take charge of health and social care services. 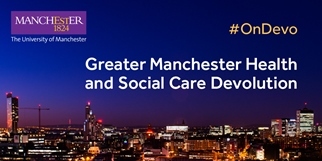 On 1 April, Greater Manchester will lead the way by becoming the first region in the country to have devolved control over integrated health and social care budgets – a combined sum of more than £6 billion. It means that – for the first time – local leaders and clinicians will be able to design services to directly meet the needs of local communities. As Chair of the Greater Manchester Health and Social Care Strategic Partnership Board, I have seen first-hand the progress that has been made since the historic signing of the Memorandum of Understanding in February 2015, which took place between all the major public sector bodies of the region and Whitehall. It is an exciting opportunity to improve services and address many of the health issues facing our region. Our long-term vision for devolved powers is simple; to ensure the greatest and fastest possible improvement to the health and wellbeing of the 2.8 million people of Greater Manchester. The process of devolution provides us with the tools to make this happen. Establishing the new system has been the crux of our focus for the past 12 months and we have made unprecedented and unrivalled progress in this regard. Quite frankly, the progress we have made has been revolutionary for the region. We have had to agree and establish a new governance structure that has both strategic oversight for all matters relating to health and social care services and the accountability to make big, bold decisions that can truly deliver the levels of transformation we are seeking to achieve. The progress has been made possible by the unprecedented partnership working shown by the 37 organisations involved. That unity has been inspirational as we prepare for full devolution – and new ways of working that see more integration between health and social care and improving outcomes across Greater Manchester. We have the opportunity to address some major health inequalities that affect the region, while also giving us flexibility to tackle the ongoing financial strains that are creating a £2billion gap in our public service finances – making it difficult to provide the level of care we want to. This has to change. The scale of the challenge requires a major new way of thinking and a change in behaviour from everyone across Greater Manchester, from decision-makers and local organisations, to healthcare workers and patients. We want to create a health and social care system that works together at the heart of the community, helping people to live healthy, independent lives. By achieving these objectives we will make great strides in transforming the health and well being of Greater Manchester’s 2.8 million residents. It’s not going to be an easy process, and we’re undertaking huge amounts of work, with innovative ideas coming thick and fast as we look to define exactly what a Greater Manchester health and social care system looks like. We have the support of health and care organisations – our challenge in this fast-paced environment is to make sure we take our staff and of course the people of Greater Manchester with us. That’s our focus for the coming months at this historic time for our great city region. In the run up to 1 April, when Greater Manchester is handed control of its £6bn health and social care budget, we’re running a series of blogs from leading commentators on what it really means for the region. Read more on the Devolution issue. Lord Peter Smith is chair of the Greater Manchester Health and Social Care Strategic Partnership Board and the GMCA lead for health and wellbeing. He has also been leader of Wigan Council since 1991.